Commentary on Pax-related current events. Find reunion information within ‘Reunions’ category. 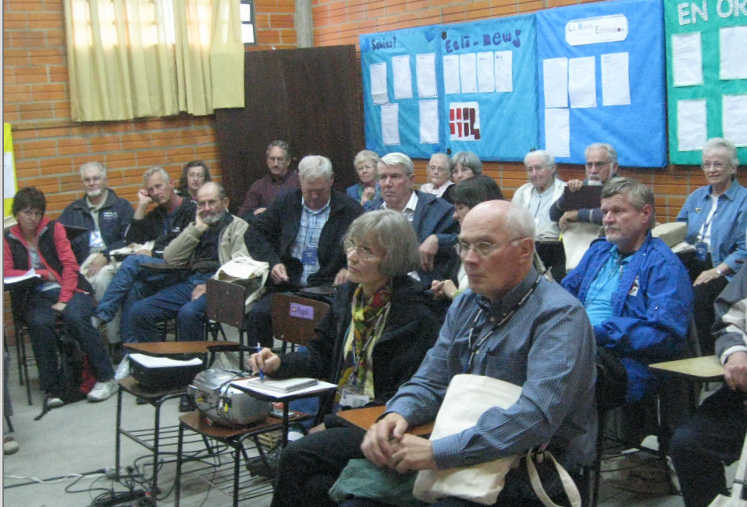 Pax Events at Assembly 15 of Mennonite World Conference – Asuncion, Paraguay – July 14 – 19, 2009. A Report with Comments. 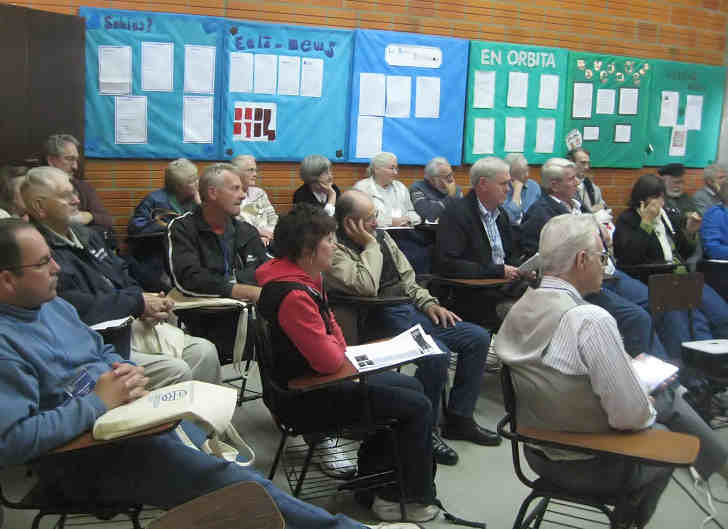 July 16, Thursday, was “Pax day” including a presentation at the general morning service on The Trans-Chaco Road delivered by Pax Paraguay veteranClair Brenneman of Palmer Lake, CO, plus a three-hour Pax Reunion during the afternoon. Traversing six blocks from the main conference center was required to a private school for our three-hour session after lunch (and short siesta). No doubt, it was assumed that spry old Pax guys would have no trouble with such a move. Brenneman officiated while Kasper worked logistics and tech. Bert Lobe, who was most instrumental in arrangements for the reunion, offered a sincere welcome from MWC, praised the Pax film, and had to hurry to another meeting with no chance for questions. Representing MCC, Ron Fleming and Herman Bontrager, recounted many values of the Pax program and distributed some detailed statistics of “then and now,” discussed recent polling of youth motivation, church support, etc. The challenges and potential of MCC’s new international, experimental, initiatives were presented. 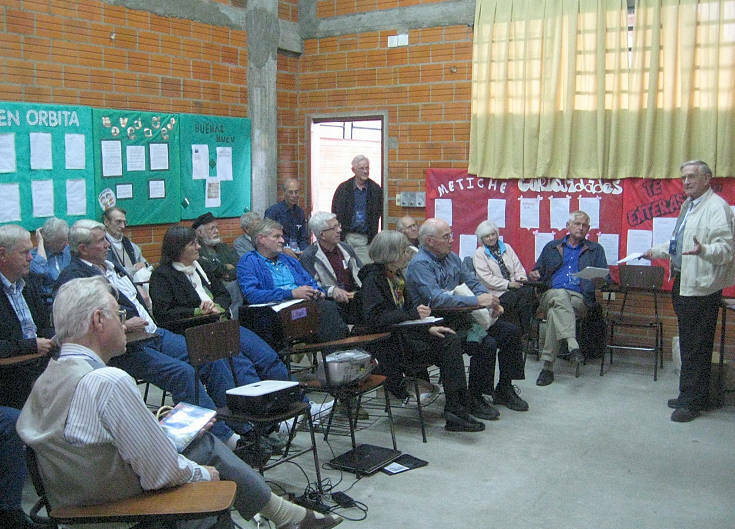 (See MCC websites: the SEED program begun in Columbia, 2009, and description of “New Wine/New Wineskins” in cooperation with MWC). I regret not having a chance to visit with Sarah Histand, who was present, about specific progress with the Histand Gift. The film PAX SERVICE An Alternative to War took a major portion of remaining time. But for many it was their first viewing and I heard very positive responses – dare we say “pride” in the film and its message. Two men with noticeable interest at the meeting, taking notes, asking questions, were sons of Paxmen – one whose father (name?) had worked in Africa, and Marvin, son of Harry Harder of Mt. Lake, MN, the first engineer and trainer of road builders for the Trans-Chaco. Another fellow provided critical, last minute, technical assistance for showing the film that day, then appropriately introduced himself as “the last Paxman in Paraguay;” he was David (of Asuncion), a son of Dr. John Schmidt (MN and KS) who founded renowned Kilometer 81-Leprosy Clinic and Hospital in eastern Paraguay. Author Gerhard Ratzlaff of Asuncion, in very few minutes, gave valuable description of his motivation – the necessity – that compelled him to writeThe Trans-Chaco Highway, How It Came to Be, a 1998 book available in English as well as German. We’ve known Herr Ratzlaff to continue expounding the MCC story, past and present, whenever he can. Finally, that afternoon, we enjoyed the greeting and special warm reminisences of former MCC Executive Director John Lapp. A unique highlight of Assembly 15 for me, in this city where Kathryn and I now teach in “retirement,” was the renewing of old and finding new Pax and MCC connections. It would be interesting to see who could identify the most individuals in these pix. Image 4 shows John Lapp speaking to the group. The distinguished gray-haired gentleman in front, shots 1 and 4, facing to the right, is Gerhard Ratzlaff. PS: In trying to purchase another copy of Cal Redekop’s book on Pax at two different booth outlets during last day of the conference, all were sold out – great! A PAX committee of Al Keim, Orville Schmidt, Arlo Kasper, Arlin Hunsberger and Cal Redekop has several projects under way–the Pax Film Project; the Histand Gift; and most recently the creation by the Mennonite Bible School near Basle of a “peace walk which features among other things a fountain rededicated to PAX. In July the Backnang, Germany community held a 50th anniversary celebration for the construction of their church house by PAX men. A number of PAX men attended. I’d like to invite a 1000 word essay on the 50th anniversary event of the Enkenbach siedlung in 2003. 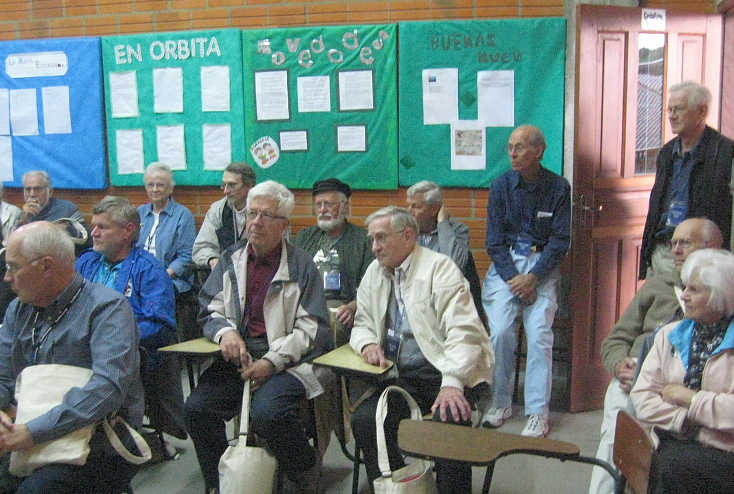 At the invitation of the siedlung and the leadership of Orville Schmidt more than 40 men and their spouses attended the event. Please send in (Webmaster@PaxMCC.com) stories, recollections, current experiences, thoughts and reflections. All will be published by this web page. What are your comments about the Film Project? Please feel free to express your self about the film project here. PAX men, please tell others of the MWR news release regarding the Bienenberg Peace Walk which will appear in latter May issue. Joe Landis, jlandis@voicenet.com is spearheading a PAX reunion in 09 at the Mennonite World Conference in Asuncion, Paraguay. Please share this idea with other PAXers.